Beginning Sunday, May 8, Metro customers will be able to use the new Martin Luther King Jr. Transit Center adjacent to the Metro Blue Line Compton Station. The new transit center will have eight new bus bays and will allow easy and safe access to the rail station. Metro Bus lines 51, 125, 127 and 128 will stop at this facility. Metro Bus Line 60 will stop in the early morning hours when the Metro Blue Line is not in service. I am glad to see that this transportation centre will open. I hope there will be connections that will be coordinated between buses and trains. What is still bad is that Line 202 will not enter the new transit center… Metro should consider aligning the route to serve the new transit center. 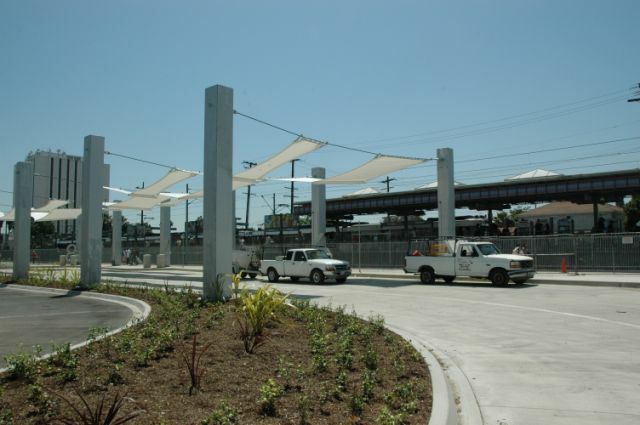 The Washington/ Fairfax Hub should be remodeled like the new Compton Transit Center. I am very happy the transit center looks much better than before. After this re-updated MLK transit center opens this week, so Metro consider putting some slightly old and new Nabi 45C Metro (81/82/83 and 8400s) on line 51, while lines 52 352 get the same, as well? This is something I have looking forward for a year or so. Although, those poles in the pictures above are not yet done;however, when everything finishing this area will look nice. The only thing I will recommend is having securities officers or Sheriff outside or near the station. A project that took a long time to complete. Aesthetically pleasing for a groundbreaking ceremony so Metro officials and local politicians can pat themselves on the back and take nice pictures despite the fact that Metro services are still inadequate. Public safety is still an issue (especially late at night) and buses/trains that do not run as scheduled and are often times runned down or dirty. @Victor C., I agree. When I drive by Washington and Fairfax I often wonder why the MTA doesn’t do something about that area. The “hub” so close to the new Expo line I was thinking it would be nice if the MTA could move the hub near the Expo station. We need to get the buses to the train stations so we can get to our final destinations. These kinds of bus hubs need to be at every suburban transit station. This helps not only visually identify a strong connection for riders of both bus and rail, but it makes it easier and more direct to board therefore streamlining the whole connection process. It gives a sense of integration of the system and elevates the status of buses as important in feeding backbone rail lines while serving hyper local areas. Now the MTA needs to actually coordinate the transfers which is perhaps the most important step. Does it have safe bicycle and pedestrian access, too? We here at the LA County Bicycle Coalition wanted to know if Metro integrated our findings from the 2009 Transit Hub Access Plan we completed. Compton station, amongst other blue line stations, was studied. Definitely keep us posted about Blue line bike/ped accessibility. I believe metro is extending routes of bus lines that currently meet at Washington and Fairfax to serve either the La Cienega Expo Station or the Culver City Expo Station. Their is Bus route Modification plan that is supposed to take place when the Expo Line opens.